Thyroid deiodinase enzymes serve to manage thyroid hormone at every level of metabolism. Even more important is the fact that these enzymes can become dysregulated by everyday common medical conditions. Understanding the importance of these enzymes is critical to understanding how to further treatment, especially if you are taking thyroid medication such as levothyroxine or Synthroid. I'm going to try and talk about one of the more complicated aspects of thyroid function and try to make it easy to understand. If you have thyroid problems, and this could be anything ranging from hypothyroidism to hyperthyroidism, then you need to have at least a basic understanding of thyroid deiodinase enzymes. These deiodinase enzymes are in most of the cells in your body and they are the things that help your thyroid do its job. 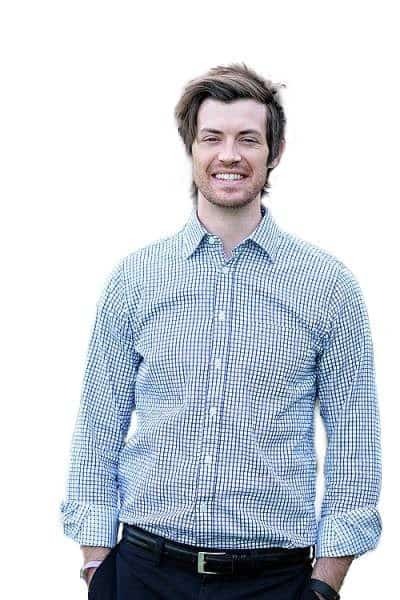 If you know a little bit about thyroid function then you probably know that it's an incredibly important topic. Because up to 10% of the population suffers from thyroid disease in some way and the management of thyroid-related problems results in unhappy patients (1). A large part of the problem relating to unhappy patients with thyroid disease may have to do with a fundamental misunderstanding of how thyroid hormone operates in the body. It's much more complex than your thyroid gland releasing thyroid hormone into the bloodstream and calling it a day. It turns out, instead, that thyroid hormone is highly regulated by these deiodinase enzymes where they serve to either activate, inactivate and control the concentration of thyroid hormone in both your cells and bloodstream. This image illustrates how T4 (the predominant thyroid hormone) is metabolized inside your body and inside of your cells. T4, also known as thyroxine, comes from the thyroid gland where it is produced under the influence of TSH (thyroid stimulating hormone). Once your body produces T4, also known as thyroxine, it is then acted upon by the deiodinase enzymes to either become active as the T3 thyroid hormone or become inactive as the reverse T3 (rT3) metabolite. Your body uses these enzymes to tightly regulate thyroid hormone activation and inactivation depending on what is happening to your body. Factors such as stress, how much food you eat, exposure to bacteria, illness, medications, the presence of hormone imbalances and nutrient deficiencies all impact how well (or not) your enzymes function. And the function of these enzymes is perhaps more important than the status of free thyroid hormone levels in your body! Studies have shown that the concentration of free thyroid hormones in your body (meaning what is produced by your thyroid gland) are not produced in high enough amounts to adequately trigger thyroid hormone receptors inside of your cells (2). The only way they can achieve a high enough concentration to actually become active is through the influence of these enzymes. TRH is produced in the hypothalamus. TRH stimulates the release of TSH from the pituitary. T4 circulates in the bloodstream to target tissues such as your liver, kidney, muscles, heart tissue, brain cells, skin cells and so on. T4 is either activated or inactivated based on the demand of each tissue. If you are exercising and using your muscles then your body may activate more thyroid hormone in your muscles but deactivate it in your intestinal tract (you don't need to digest food while exercising!). If you are thinking really hard or studying for a test your body may activate more thyroid hormone in your brain and inactivate some in your muscles. Deiodinase enzymes are responsible for controlling the activity and metabolism of thyroid hormone systemically (for the whole body) and locally (in each cell). The amount of T4 and T3 feedback up to your hypothalamus where they influence how much TRH is being released. This is a (very) simplified version of the entire process from start to finish, but it really helps put everything into context. It's also important to realize that most physicians focus only on step 2 of this process, where TSH is produced, and use TSH as a marker for assessing the entire process. By doing so, these physicians are missing out on the impact and important role of deiodinase enzyme activity and how they influence specific tissue levels of thyroid hormone. This, in my opinion, is, at least in part, why so many thyroid patients are unhappy with their current thyroid management and treatment plan! D1, also known as DIO1 or iodothyronine deiodinase 1 (3), should be considered an 'activating' thyroid enzyme. The main job of D1 is to help control how much thyroid hormone is being produced from the thyroid gland and it also contributes to T3 levels found in the serum. D1 plays a major role in regulating how much thyroid hormone is being produced systemically or for the entire body. DIO1 is found in the liver, kidney, thyroid and pituitary tissues. The liver and kidney are organs in your body which receive a rich supply of blood, so it makes sense that these tissues contain the D1 enzyme. As blood reaches these organs, D1 can take the T4 which is being produced from the thyroid gland and either activate it or tell the body to produce more. Naturally, as you might suspect, a decrease in this enzyme would result in lower than normal free T3 levels and lower than normal T3 and T4 levels in the blood. D2, also known as DIO2 or iodothyronine deiodinase 2 (4), can also be considered an 'activating' enzyme. DIO2 is responsible for the majority of T4 to T3 conversion found in circulation around 70%. You can compare this value to DIO1 which is responsible for around 30% of T3 found in the bloodstream. You can think of D2 as being the most important regulator of thyroid function and metabolism in the peripheral tissues or inside of the cells. In this way, D2 is primarily responsible for activating and inactivating thyroid hormone cellularly and based on the demands of each tissue. DIO2 is found in the thyroid, central nervous system, pituitary, and skeletal muscle. A problem with DIO2 may result in reduced free T3 levels. D3, also known as DIO3 or iodothyronine deiodinase 3 (5), should be considered an 'inactivation enzyme'. D3 is responsible for taking T4 and inactivating it by turning it into the inactive metabolite reverse T3 (rT3). D3 also stimulates the breakdown of the active thyroid hormone T3 into a less active form known as T2. So, your body can upregulate the expression of DIO3 to help inactivate thyroid hormone at the cellular level and in the serum. There are certain conditions which cause your body to increase the function of DIO3 while downregulating the function of the other enzymes. These problems, which you'll find to be quite common, are discussed below. Remember when I said that most physicians don't take into account the function of these enzymes? It may turn out that this is a big mistake. We already know, undisputedly I might add, that these deiodinase enzymes impact how thyroid hormone is processed in your body. The prevailing thought, when it comes to thyroid management, is to assume that the body does the conversion process perfectly well and without any issues. So, as the thought process goes, if you provide the body with enough substrate (in the form of T4 thyroid medication) then it will have no problem activating or inactivating thyroid hormone as it sees fit. There are many factors, which many patients suffer from, which serve to inactivate these deiodinase enzymes. Inflammation: Inflammation inhibits DIO1 activity (6) thereby reducing thyroid conversion capacity. 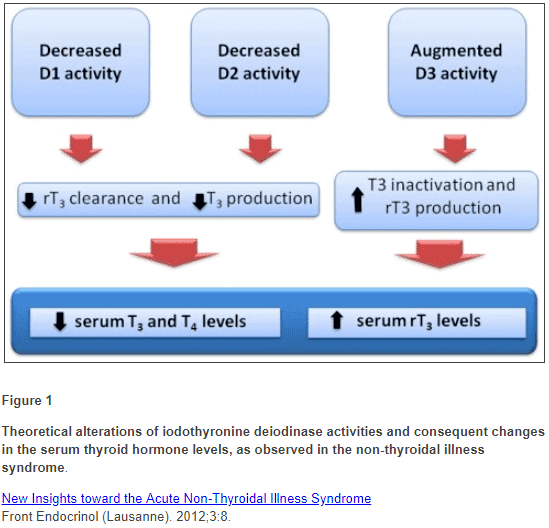 Nonthyroidal illness or euthyroid sick syndrome: This thyroid lab pattern results in decreased D1 and D2 activity with an increase in D3 activity (7). The net results are decreased free t3, high reverse, T3 and a normal TSH. This condition is the result of many conditions including recent acute illness, chronic illness, and dieting. Exposure to LPS: LPS (which stands for lipopolysaccharides) causes a decrease in DIO1 expression and activity (8). LPS or endotoxin are components of the bacteria in your gut. In conditions that result in increased intestinal permeability (commonly referred to as leaky gut), LPS levels may rise and cause dysfunction in thyroid function. Dieting and Fasting: Fasting and caloric restriction have been shown to reduce deiodinase activity (9). This is probably a protective response from the body to help reduce caloric burn in starvation states and may explain why dieting is harmful to thyroid function. Selenium Deficiency: Selenium is required for deiodinase activity (10) and a deficiency in this mineral results in both decreased receptor expression and decreased enzyme function. Insulin resistance: Excess insulin (known as insulin resistance) has been linked to certain polymorphisms in deiodinase enzymes (11). As you start to dive into this concept more heavily you may notice that many of the problems listed above are common among medical conditions that patients suffer from today. The inflammatory process is at the heart of almost all major disease states and medical conditions ranging from heart disease to gingivitis. From your perspective, what this means is that these conditions, which many of you probably have, may further disrupting your thyroid hormone status and complicate your medication management. Thyroid Lab Tests vs Deiodinase Enzymes - Which is More Important? While we know that the function of these deiodinases is of utmost importance to your thyroid function, how do they fit in together with your thyroid lab tests? Currently, we don't have a great way to assess the function of deiodinase activity because all of this activity is happening inside of the cells in your body. Studies have even gone as far as to say that the function of these enzymes is more important than the absolute level of thyroid hormone in your body or serum. Because, even in the presence of low circulating thyroid hormone, your deiodinase enzymes can potentiate the action of thyroid hormone by constantly activating T4 into T3. Let's assume that you have hypothyroidism from Hashimoto's thyroiditis. Hashimoto's, as you know, causes damage to the thyroid gland which ultimately results in a reduction in circulation T4 and T3 in the body. This reduction in thyroid hormone will be felt by cells in the body and the consequence will be a change in how deiodinase enzymes function. As T4 levels fall, your body may constantly attempt to keep T4 to T3 conversion active in the cells to keep T3 levels high enough to latch onto thyroid hormone receptors and activate genetic transcription. This is primarily done through the upregulation of deiodinase activity (12) (especially D1 and D2) and the downregulation of D3 activity. So, your body can maintain a relatively "normal" level of thyroid hormone in the cells even in the face of thyroid gland damage. This is how regulation occurs at the local level and may explain why patients with Hashimoto's (even with thyroid gland damage) can still have relatively normal free T4 and free T3 levels in the serum. I call this your 'thyroid reserve capacity' or the ability of your body to utilize what little amount of thyroid hormone it has available. And this phenomenon, shouldn't be surprising because we know that other organ systems and tissues display similar behavior under stress or damage. Your liver, for instance, can continue to function even in the face of over 50% damage to its cells. Thyroid lab tests offer a way for us to potentially look into the cells and look into deiodinase activity. Using thyroid lab tests such as Free T3, Free T4, Reverse T3 and TSH may help to provide insight into the function of these enzymes. They won't allow us to look at the tissue-specific activity (for instance, how well is your pituitary functioning vs your heart and so on) but it can give us a general idea as to how they are functioning in the entire body. We know from basic thyroid physiology, that in order for T4 to become activated it must be acted upon by either D1 or D2. 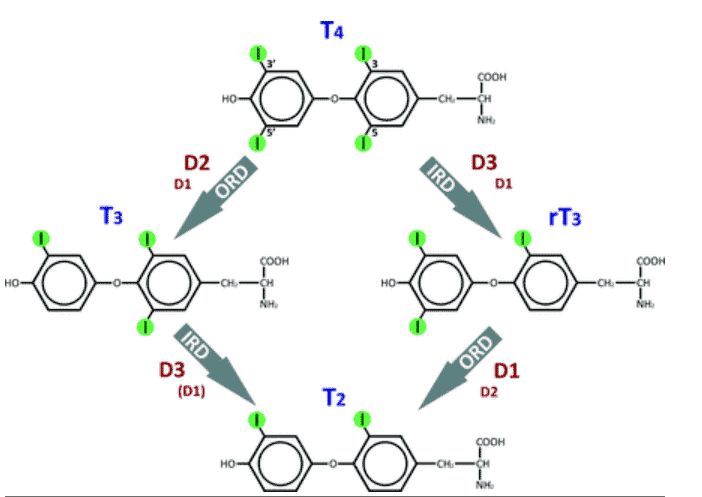 From there, T4 will lose an iodine moiety and be turned into free T3. The more that this occurs we would expect that free T3 levels should increase while free T4 levels should decrease. On the flip side, if T4 is acted upon by D3, we know that it will lose an iodine moiety but it will be converted into the inactive metabolite reverse T3. We would, therefore, expect that in cases of conversion from T4 to reverse T3 that free T4 levels would be low-normal, free T3 would be low and reverse T3 would be high. The absolute values of these free hormones may not be as important as the change in the values over time or in the pattern that you see on your labs. One way to evaluate the function of these enzymes is to compare your current results to whatever your 'baseline' lab results should be in an ideal scenario. For best results, this would require that you have a baseline set of 'normal labs' from when you were healthy to compare your current results to. If you don't have a new set of labs then you can always monitor these thyroid lab tests as you change medication dosages and as your disease progresses or regressions (hopefully). Not only can certain medical conditions cause disruption to the function of deiodinase enzymes, you can also experience problems simply by virtue of your genetics. Many different SNP's have been associated with the presence of certain medical conditions (you can see the list below). SNP's, which stands for single nucleotide polymorphisms, are tiny changes in your DNA and the presence of these SNP's have been used to determine your risk of developing certain medical conditions. Genetic tests such as 23andme can show you if you have any of these SNP's. It's important to understand, though, that the presence of the SNP doesn't necessarily mean you will have the disease, but it certainly increases the likelihood that you will. In the context of thyroid function, these SNP's seem to be associated with the function of deiodinase enzymes in certain tissues. Most of the SNP's we are concerned with seem to impair the ability of your enzymes to function, and it may be this lack of function which has significant clinical importance. Certain SNP's, such as rs225014, if present, may impact your ability to tolerate certain medications or utilize certain medications. Studies have found that patients who have this specific SNP tend to do much better on combination T4 and T3 thyroid medication compared to T4 medication alone. As we learn and understand more about these SNP's I am confident that they will allow for a more personalized approach to thyroid management and may become an integral part of thyroid hormone management. You can test these SNP's right now, but the chances of your doctor understanding what to do with it may be slim. Your deiodinase enzymes serve a very important purpose in maintaining thyroid function in both the entire body and at the cell level. Dysfunction in these enzymes can occur in the presence of certain medical conditions and should be taken into account if you are not doing well with your current management. The function of these enzymes may also help to explain why certain patients do better on T4 only thyroid medications and why others may benefit from combination treatment with LT4 and LT3. Your genes may also play a role in how active (or inactive) these enzymes are. Many different single nucleotide polymorphisms have been associated with the development of certain disease states. You can identify the presence of these SNP's through genetic testing. From there you can use this information to help determine your treatment and be mindful of your risk for certain medical conditions. Do you suspect that you have deiodinase dysfunction in your body? Are you doing well on your current medication? Do you think your genes are playing a role in how you tolerate certain medications?